Fairwaves base stations are designed from the outset with harsh environments in mind, benefiting from industrial-grade components and features selected to ensure that they still work reliably at extreme temperatures, and come rain or shine. This is vital when deployed as part of solutions that offer zero maintenance, with remote configuration and support. 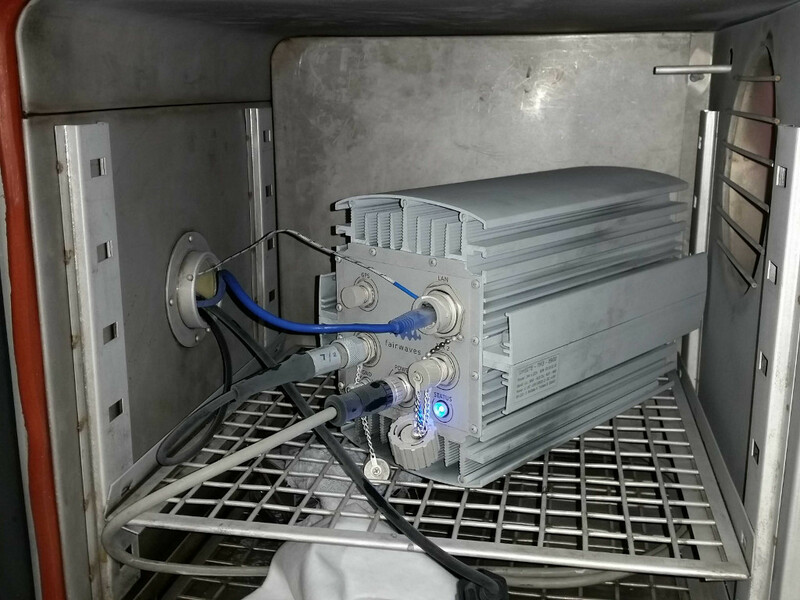 In a previous post we took a look at initial leak testing of UmSITE hardware, which lead to an improved gasket solution being used in order to meet the desired level of ingress protection. In this post we take a look at UmSITE operation at extreme high and low temperatures, to ensure that there is minimal degredation in performance. 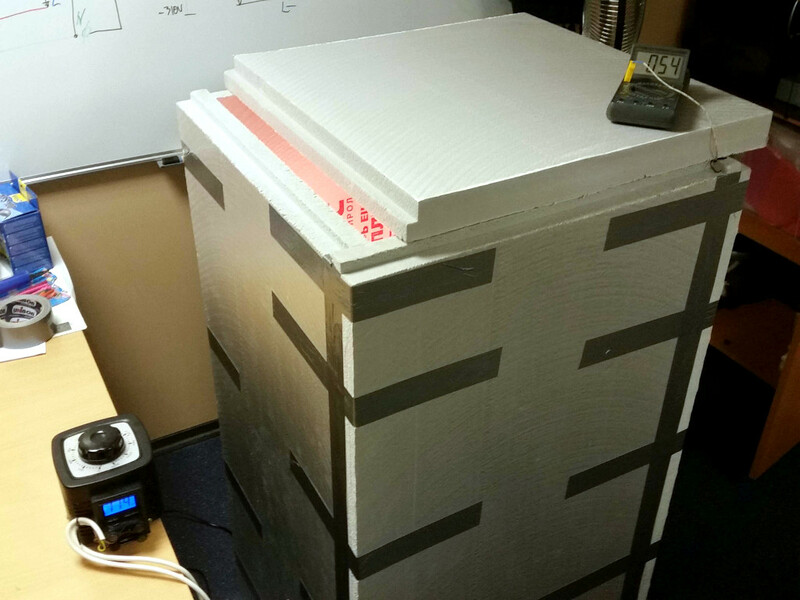 For testing at temperatures up to +65C a chamber was constructed from insulation panels, using a 75W incandescent lamp as the heat source. A fan equipped with a variac for speed control ensured an even distribution of air temperature, without excessive circulation. A thermocouple was used to measure the air temperature inside the chamber. 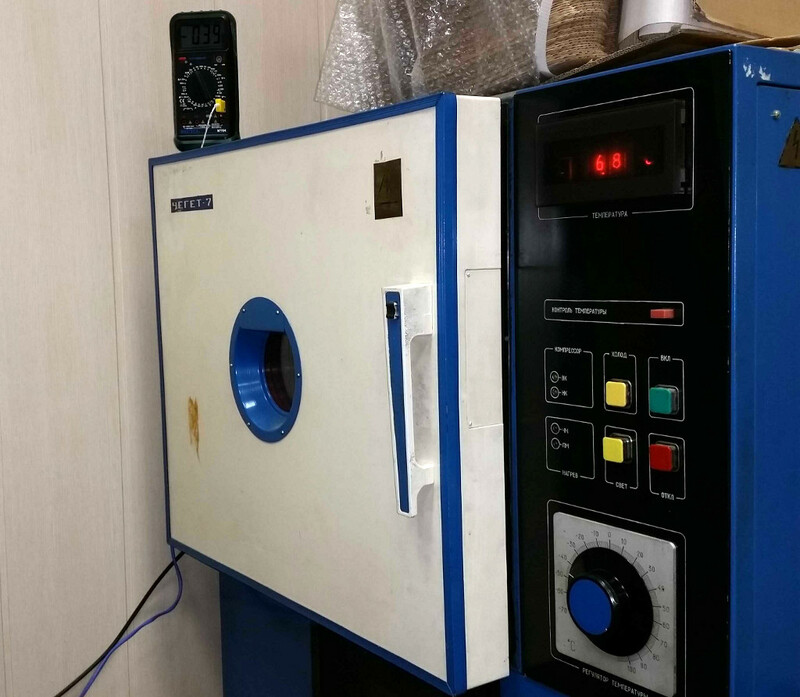 Testing at down to -40C was carried out using an environmental chamber. Again a thermocouple was used to confirm the air temperature inside. 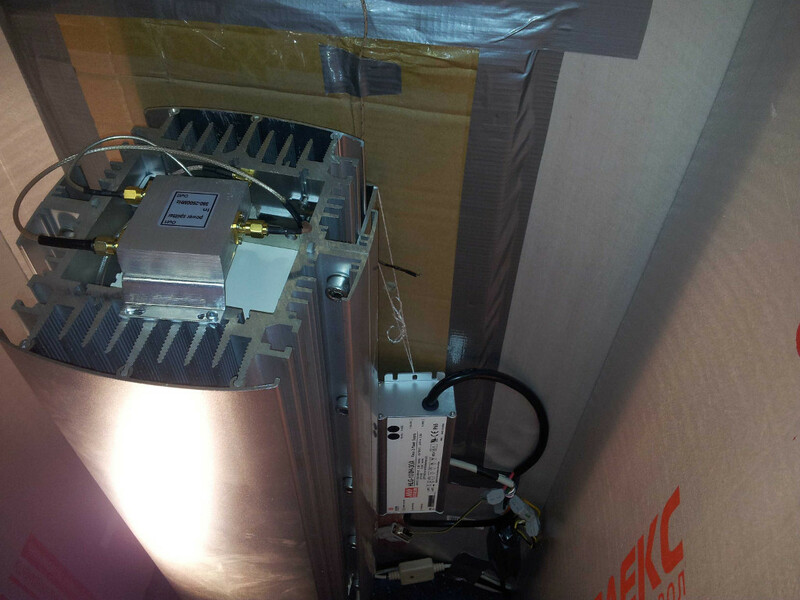 An RF splitter was used to feed the first ARFCN to both PAs simultaneously, enabling testing with both channels being driven constantly at full TX power. 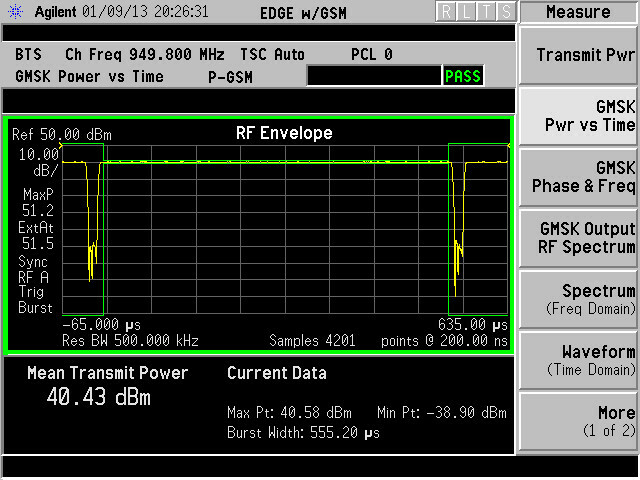 RF performance was then measured using an Agilent E4406A VSA Transmitter Tester. 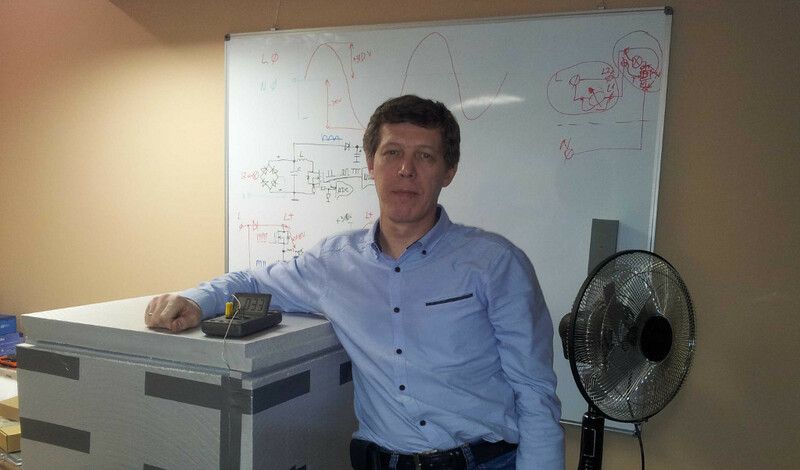 Power supplies were included in tests to ensure that they also performed well up to their 65C rating. Next we’ll look at UmSITE-TM10 (2x10W TX) performance at 65C, followed by the UmSITE-TM3 (2x3W TX) at -40C. 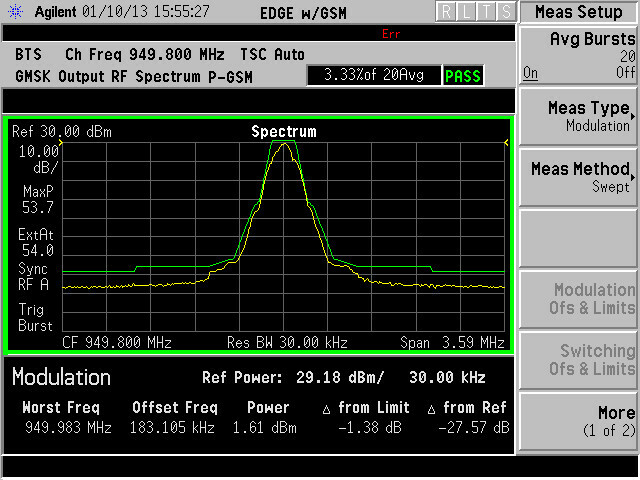 In this first screen capture we can see that the measured spectral mask (yellow) remains a healthy 1.46dB below the limit set out in the GSM specification, allowing for some variation. 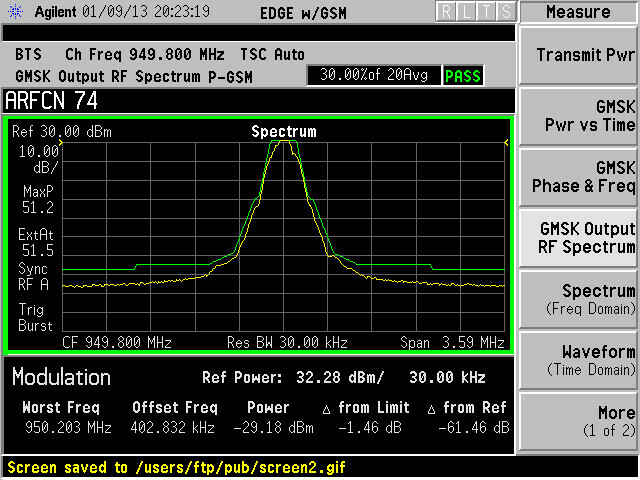 The next capture shows the RF envelope, with time on the X axis and power on Y. At more typical ambient temperatures the TX output is ~41dBm (13 watts), and so a degradation of only 0.6dBm up at an ambient temperature of 65C means that the PA is still doing a great job! Note that originally OpenBTS would not always pass the RF envelope test and so Fairwaves funded work on the OsmoTRX transceiver code to improve this. In this screen capture we can see the phase error, which contributes to link quality. 1 degree peak and 5 degrees RMS phase error is pretty much the industry standard. 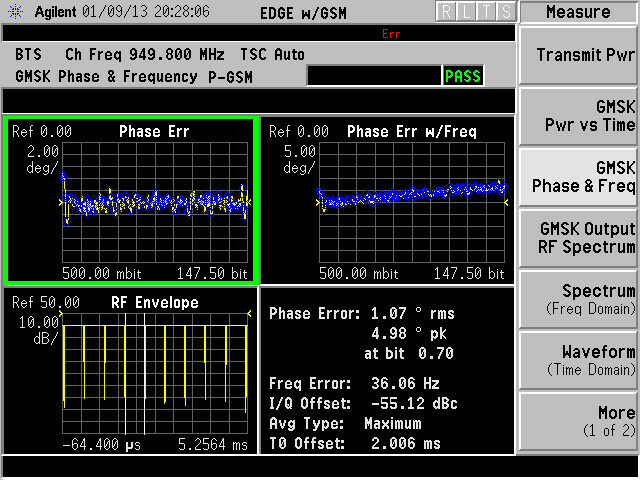 David Burgess has put together an excellent concise write-up on the importance of frequency control in GSM. In short, the specification requires 50ppb precision. At 900MHZ this is approximately 50Hz and since tests were conducted indoors and without a GPS antenna connected, the error was up at 36Hz. 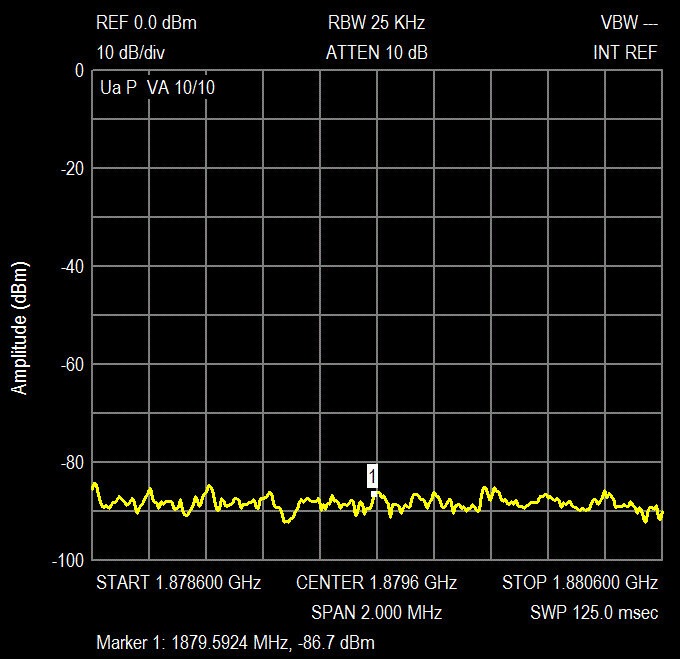 However, with the UmTRX onboard GPS reference active we typically see <10Hz offset. This final image from the TM10 tests shows that we have no second harmonic, which means that the duplexer is doing a good job at filtering out-of-band transmissions. Next we’ll take a look at the Temperature measurements from the sensors on the SBC and UmTRX. The power supply is coping well and delivering 28V! Now we’ll take a look at UmSITE-TM3 operation down at -40C. In this first screen capture we can see that the TX output is a healthy 5 watts. 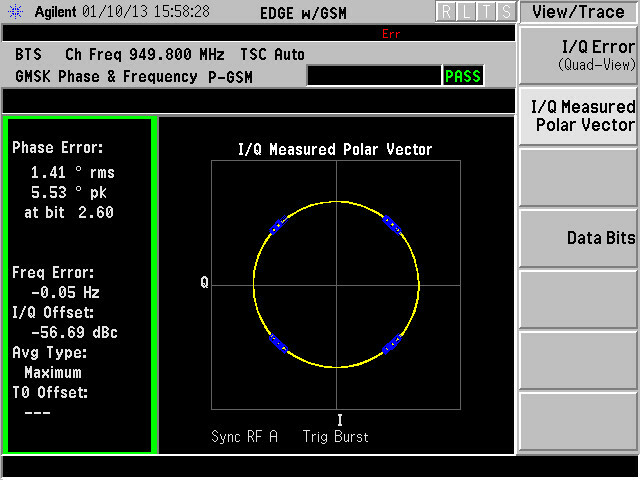 The next shows that there is an increased phase error, but this is still within the GSM specification limit of 5 degrees RMS and 20 degrees peak. Once again the spectral mask is within spec. Finally, the IQ plot (similar to the second above) confirms that everything is as it should be. Which all results in a happy Andrey Sviyazov!